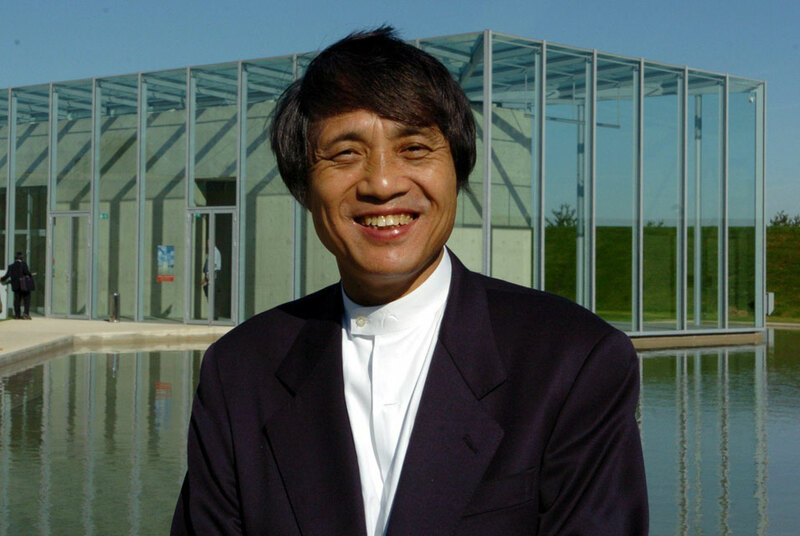 File photo of Japanese architect Tadao Ando stands in front of the art and exhibition complex which he designed at the Hombroich missile station, a former NATO base. EPA/Achim Scheidemann. WILLIAMSTOWN, MA.- The Sterling and Francine Clark Art Institute announced the launch of the final phase of its campus expansion project and a series of programs that will extend the Clarks reach and engagement during the time of construction on its Williamstown site. The series of programs, called ClarkNOW, encompasses more than 60 projects over the next three years in Williamstown, New York, and around the globe, including exhibitions, installations, and academic programs. The Clarks Director Michael Conforti announced substantial completion of a major infrastructure project launched last year and the initiation of construction activities to continue work on the final phase of the campus expansion program. The project includes construction of a new 44,400-square-foot Visitor, Exhibition, and Conference Center designed by Pritzker Prize-winning architect Tadao Ando; renovation of the existing museum building and Manton Research Center by architect Annabelle Selldorf; and a sweeping new landscape design by Gary Hilderbrand that will reorient the visitor experience on the Clarks 140-acre property to highlight its natural setting and enhance sustainability. The project is expected to be completed in summer 2014. The Clarks final phase of its campus expansion program is now underway. A master plan developed by Cooper, Robertson & Partners, finalized in 2001, dramatically reconceived the entrance sequence to the Clarks grounds and created a framework that allowed for physical expansion, improved circulation, and a dramatic embrace of the Clarks extraordinary campus. Tadao Ando Architect & Associates, Osaka, Japan, and landscape architects Reed Hilderbrand Associates, Watertown, Massachusetts, were selected to articulate the campus plan, which included pivotal decisions to remove the current maintenance building and relocate main parking areas in order to make way for significant landscape and architectural changes. Architect Annabelle Selldorf of Selldorf Architects, New York, was commissioned to renovate the original 1955 museum building and the Manton Research Center (built in 1973) in a way that would respect the original architecture, repurpose spaces to better serve both the museum and research and academic programs, and enhance the visitor experience. The first phase of this plan was completed in 2008 with the opening of Stone Hill Center  designed by Tadao Ando  which created new gallery spaces, meeting rooms, an outdoor café with scenic mountain views, and a state-of-the-art facility for the Williamstown Art Conservation Center. In summer 2010, work began on an infrastructure project that includes a new loading dock, food service and core mechanical facilities, and other support spaces. That project has now achieved substantial completion. The stone, concrete, and glass Visitor, Exhibition, and Conference Center (VECC), designed by Tadao Ando, will serve as the new entry to the Clark. It will house special exhibition galleries, new conference facilities, dedicated spaces for family and community programming, and amenities including new visitor information, retail, and dining facilities. Features of the new building include: 10,500 square feet of galleries available for special exhibitions, nearly doubling the current space for temporary shows; a multi-purpose pavilion for conferences, lectures, and special events, as well as installations of works of art; and art transit facilities. The VECC will link to the original museum building through a light-filled glass entry pavilion that will create a new west-facing entrance to the 1955 structure, returning the buildings orientation to its original west-to-east axis. When complete, the project will seek a LEED Silver certification. This VECC project has received $30 million in financing through bonds issued by MassDevelopment, the state of Massachusettss finance and development agency, which works with businesses, nonprofits, financial institutions, and communities to stimulate economic growth across the Commonwealth. The first expansion and renovation of the Clarks original museum building adds more than 5,400 square feet of new gallery space for the display of the Clarks collections, a 45 percent increase. Architect Annabelle Selldorfs sensitive reconfiguration of former office and storage areas into new galleries on two levels enables the Clark to present more of its collection without disrupting the museums original atmosphere and scale. Enhancements to the museum building include: new galleries dedicated to European and American decorative arts; a new gallery for American art; a complete renovation of the original galleries; an orientation room focused on the Clarks special site and mission; additional spaces for special installations of works of art; and improved lighting and climate control systems throughout the galleries. Architect Annabelle Selldorfs design for the renovation of the Manton Research Center reinforces the buildings purpose as the center for research and academic activities, while providing increased access to the Clarks important collection of works on paper. Renovations to the Manton Research Center include the creation of: a new Manton Study Center for Works on Paper, providing greater access to the Clarks collection of prints, drawings, and photographs; a new public reading room in the courtyard, enhanced by a bookshop, information area, and coffee bar; and a new gallery for the exhibition of prints, drawings, and photographs. In addition, the project will include renovation of gallery space dedicated to the Manton Collection of British Art and technological upgrades to optimize the Clarks auditorium for lectures, conferences, and performances. Reed Hilderbrand has worked with Tadao Ando to articulate a sweeping new landscape design for the Clark that balances visitor experience with environmental sustainability, enhancing the Clarks campus in the process. The unifying element of the landscape design is a tiered 1.5-acre reflecting pool that replaces current parking areas and unites the natural setting with surrounding buildings. The reflecting pool is also at the heart of a sophisticated water engineering program that significantly reduces the Institutes impact on natural resources and underscores its commitment to stewardship of the land. Key elements of the landscape design include: a new entrance drive reorienting visitors arrival on campus; an integrated water management system that reduces potable water usage on-site by 50 percent; two miles of new walking trails providing greater access to the meadows, woodlands, and seasonal streams on the Clarks campus highlighted by interpretive trail markers noting geological features and conservation initiatives; substantial new plantings of native species, including more than 350 trees; and landscaped parking accommodating 340 vehicles. ClarkNOW encompasses more than 60 exhibitions, installations, and academic programs presented in Williamstown, New York, and around the world. The Clarks Williamstown campus will remain open throughout the expansion project, providing visitors with new presentations of its permanent collection and a series of special exhibitions and collaborations. The first ClarkNOW exhibition, Rembrandt and Degas: Two Young Artists, will open in Williamstown on November 13. Co-organized with the Rijksmuseum, Amsterdam, the exhibition will for the first-time explore Rembrandts influence on Degas through the juxtaposition of youthful self-portraits by these two artists. The exhibition, which drew critical and public acclaim during its recent presentation at the Rijksmuseum, will make its U.S. debut at the Clark where it will be on view through February 5, 2012, before traveling to The Metropolitan Museum of Art in New York. Conforti announced the opening of a Clark office in Manhattan at the Explorers Club  the former home of Sterling Clark's brother Stephen. The Explorers Club will be the site of the first ClarkNOW exhibition in New York, an installation by artist Mark Dion, which will open in spring 2012. Dions project, Phantoms of the Clark Expedition, is inspired by Sterling Clarks scientific expedition through Northern China in 190809 and will be installed throughout the historic building. The exhibition will be open daily to the public with no admission fee. Phantoms of the Clark Expedition also creates a connection to two exhibitions that will be presented on the Clarks Williamstown campus in summer 2012  Unearthed: Recent Archaeological Discoveries from Northern China (June 18October 21, 2012), and Through Shên-Kan: Sterling Clark in China, 190809 (June 18October 21, 2012). Unearthed features significant works of ancient Chinese art, many of which have never before been seen outside China, while Through Shên-Kan will display historic artifacts and documents tied to the Clark expedition, including specimens collected during the scientific trek on loan from the Smithsonian Institution. The Clark has worked closely with Chinas Ministry of Culture over the last several years as part of an on-going cultural exchange initiative. It is through these efforts that special permission has been granted to allow the archaeological objects to be presented at the Clark in commemoration of the 100th anniversary of the publication of Through Shên-Kan, the book written by Clark and naturalist Arthur de Carle Sowerby documenting the important scientific expedition. A key component of ClarkNOW is the Institutes international tour of works from its noted collection of nineteenth-century French paintings. Conforti announced that the tour will continue to Japan in 2013 and will then travel on to venues in China and Korea. Tokyos Mitsubishi Ichigokan Museum will present the Clark exhibition from February 9 to May 26, 2013, followed by an exhibition at the Ando-designed Hyogo Prefectural Museum of Art in Kobe from June 8 to September 1, 2013. The international tour will close its run in Giverny on October 31 and will open at Barcelonas CaixaForum on November 17. Venues in 2012 include: the Kimbell Art Museum, Fort Worth, Texas (March 11  June 17, 2012); the Royal Academy of Arts, London (July 7  September 23, 2012); and the Montreal Museum of Fine Arts (October 8, 2012  January 20, 2013).